I know that it is not easy to squeeze, on a page basis, the vision and the understanding of a border discipline like Sidereal Astrology. I am going to limit myself to the highlights, always keeping in mind also readers who are not expert in Astrology. So forgive any deficiency. I hope to have soon my book "Astrologia Siderale" translated in English. The two zodiacs, sidereal and tropical, have always existed; in fact they developed in different areas of our Planet for the different sky dynamics observable from areas closer to the equator than the northen regions. 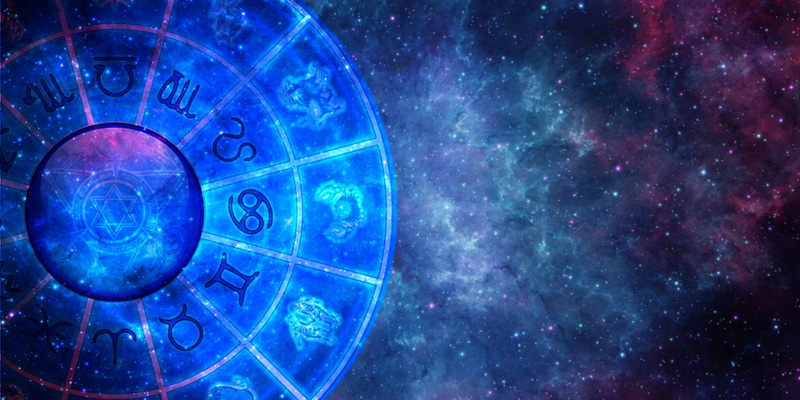 The fact that, depending on the type of the zodiac used, you can build different astral charts has unfortunately created confusion, disputes and misunderstandings. 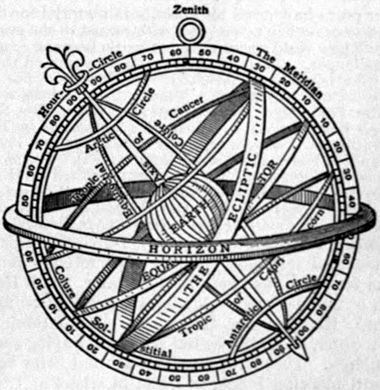 The astrological system used by almost two millennia in the West is based on the relationship between the Earth and the Sun and takes as reference a calendar based on natural equinoxes and solstices; This system is called tropic, or tropical, as it is based on seasonal change (tropicum in Latin). It was formerly used by the cultures of the northern lands to make up the calendar and was later perfected by the Greeks. The astrological cycle of the tropical system begins with the spring equinox, considering the Sun at 0° of Aries; so it was actually nineteen centuries ago, at the time of Ptolemy, its founder. But, because of the precession of the equinoxes (which is not calculated in this system), the point of equinox today, year 2015, is located at 5° of the Constellation Pisces, with a phase shift of 25°. The Sidereal Astrology, used by the civilizations near the tropics and the equator, descends from an ancient and initiatory tradition; it relies on the relationship between the Earth, the Sun and the Stars. Its primary reference are therefore the fixed Stars (particularly Aldebaran, Antares and Spica) and the real Constellations of the firmament. The Vedic tradition of India, for example, has always followed this model, as well as, in ancient times, the Chaldean-Babylonians, the Egyptians and Mayans. This type of Astrology is called stellar or sidereal (from Sidera, Stars in Latin). 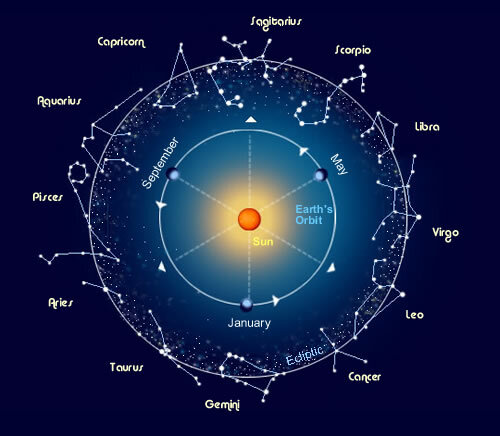 It takes into account the precession of the equinoxes and describes in the natal chart the real sky, or rather the Planets and Constellations arranged as actually observed. The sidereal astrological system was rediscovered and re-evaluated in the West in the middle of the last century thanks to the reconstruction of the Chaldean-Babylonian zodiac and the work of Cyril Fagan, Irish astrologer and egyptologist. The phenomenon of the precession of the equinoxes is due to a slow conical movement of the Earth's axis, similar to that of a spinning top that begins to falter. This motion, whose overall cycle is 26,000 years old, moves backward the vernal point (spring equinox), compared to the Constellations, one degree every 72 years and it is at the origin of the cycle of astrological Ages (Age of Pisces, of Aquarius, etc.). 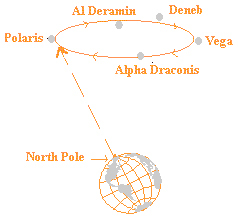 Even the celestial North Pole moves accordingly, fluctuating every 13,000 years between the North Star and Vega. We can say that the tropical Astrology, to compensate the slow movement of precession, uses solar Signs such as labels (ideal references) to be placed between the solar system and the Stars. Nowadays the Sign of Aries (ideal label) covers almost the entire Constellation of Pisces (Stars in heaven). This creates the perception that the two zodiacs are in two different places, but actually they are pointing to the same direction. 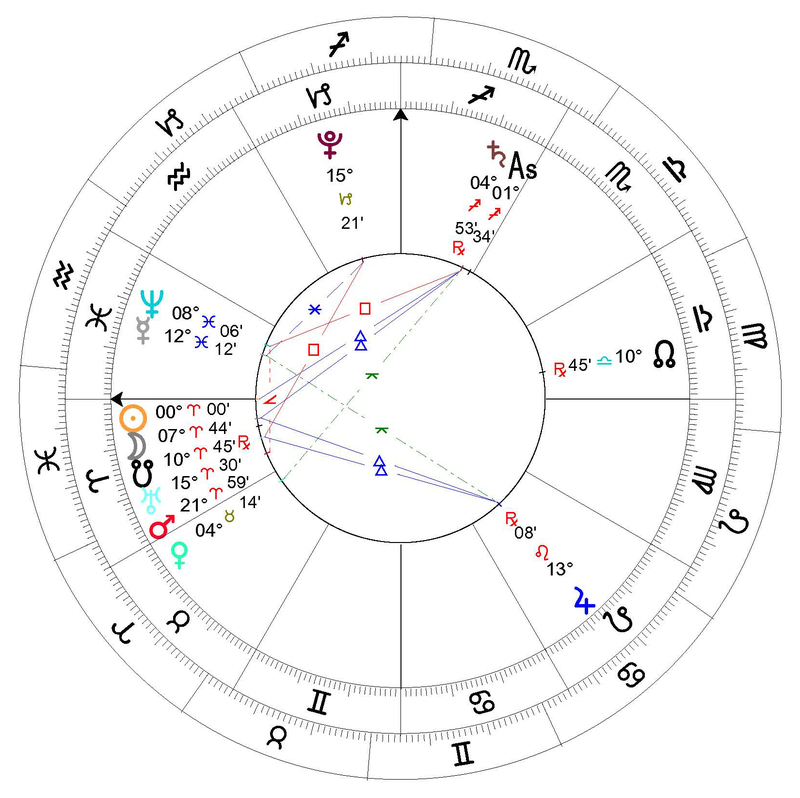 At the equinox the tropicalist astrologer sees the Sign Aries behind the Sun, while the siderealist goes beyond the ideal label and sees the Constellation of Pisces. The following figures show the Star map for the spring equinox in 2015 with both tropical (inner) and sidereal (outer) zodiac. Technically, the position of the Planets relative to the houses and the planetary aspects remain unchanged, since the phenomena is confined into the solar system; what really changes is the ring of the Zodiac that, in tropical, is forwards by 25° (for the accuracy: 24° 58'). 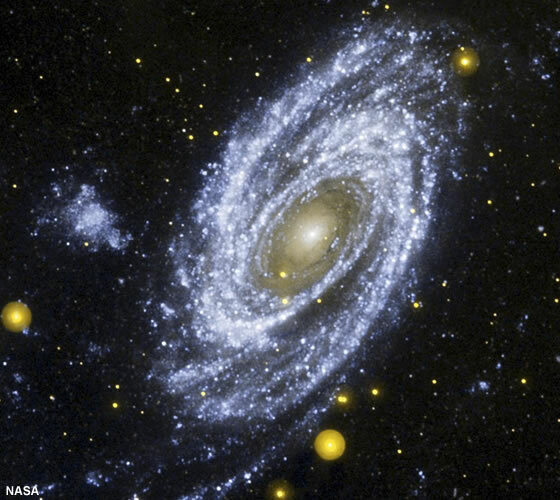 Taking the real Stars as reference, and thus aligning properly our birth chart to the Galactic Center and the Galaxy itself, means to recognize the forces that powerfully pervade our dimension and our Planet from the Galaxy, or rather from the different portions of the sky. It means recognizing our Galaxy as a symbol of everything that surrounds us, as cosmic entity to which our solar system belongs and to which we all belong as terrestrial beings. It means to turn our eyes beyond the boundaries of the solar system and become aware of the cosmic forces that are occurring at this time on our Planet: a rapid change and a new holistic awareness, trans-personal and multidimensional. This spirit is reflected in the sidereal astrological practice, that, integrating with the unity of our Galaxy, reveals new insights about our models of operating. In particular my approach to the Sidereal Astrology embraces a vision of reality based on a "unified field" of energy and, on a higher plane, of self-conscious consciousness. It proposes the overcoming of the idea of separation of phenomena. In this view every phenomenon we experience is manifested in the synchronicity of our local reference system with celestial plans: the solar system, the Stars of the Galaxy and beyond. Ultimately, in a multidimensional vision, celestial events become inseparable from our local reality. For this reason, the Stars - the REAL ones in the sky - and therefore also the Constellations, that they compose, are taken as a reference. On this basis, while it is fair to say that the Sidereal Astrology is based on the fixed Stars, on the other hand its model is not to be reduced to a mere astronomical figure or a simple technicality, as its detractors like to state. Actually Sidereal Astrology, referring to the light of the fixed Stars and not to the local seasonal cycles, is targeting the forces of the Galaxy operating at the time of the incarnation of the person, so defining his soul characteristics, rather than aiming to the solar cycles that have moulded his identity. A concept that we find also in Rudolf Steiner’s Astrosophy and on Robert Powell’s works. Ultimately the work is not to define your personality, but to free yourself from the false ideas that you have on yourself and that limit your real potential. Personal experience and inspiration from ancient Egypt have led me to evolve the interpretation method proposed by Cyril Fagan in a way to avoid falling into confusion due to the homonymy between solar Sign and celestial Constellation. This, due to the mismatch between tropical and sidereal zodiac, would simplistically bring to the assumption that you change sign passing from one to another. In my vision, the interpretative key is more subtle and the intention is to free you from the ideas that have built upon yourself, and certainly not replacing them with other ones. 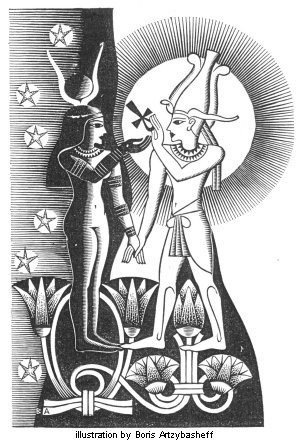 "The ancient Egyptian priests believed that the man had two minds, a solar one (Osiris) and a lunar one (Isis), giving each specific functions. This vision of two minds is still followed by different schools, with the simple difference that it refers directly to the two cerebral hemispheres." We find indications of this vision also in the alchemical iconography. On these bases I have developed, and I am using since more than ten years, an interpretive setting that considers the Moon and the Sun with equal value and regards them as rulers of the two brain hemispheres. In this method, the Sun rules our left brain, the centre of language, logic and past experience and future projection; while Moon rules our right brain, the centre of intuition, inspiration and of the living here and now. Then the Ascendant is added, which expresses the physical appearance and typology. This formulation, now described in an extremely simplified way, seems to allow, according to the analysis carried out on hundreds of birth charts, to understand the original operating model of the body-mind system of each person, beyond the social and cultural conditionings. Moreover in this way we avoid the possible confusion that arises comparing a tropical theme with a sidereal one. But, above all, we outdo the concept of attribution of Sign ("You belong to this Sign so you're done so and you behave like this..."), unfortunately nowadays turn out to be a superficial label and an element of judgment or of zodiacal prejudice. This vision, absolutely freeing, opens the possibility to go beyond the ideas that everyone has on himself and thus triggering a process of liberation. The following table shows the yearly position of the Sun compared to the sidereal Constellations. 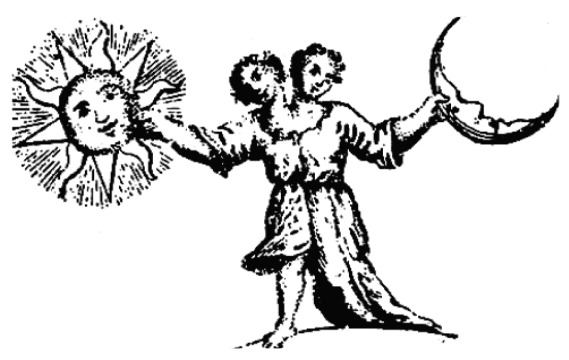 In terms of astrological interpretation of course it provides a very partial figure: it should not be separated from the position of the Moon and of the Ascendant; better if inserted in a chart completed with the celestial position of the Planets. As mentioned above, I do not recommend to fall into the easy trap of homonymy between Sign and Constellation and thus deducing that the Sign changes.